In freezing, arctic conditions at Elland Road, Atdhe Nuhiu went into full beast mode to help Owls record their first league double over Leeds United in 58 years. The Kosovo international, affectionately nicknamed ‘Big Dave’ by Wednesdayites, grabbed a second-half double as Jos Luhukay’s side took a giant step towards securing their Championship status. The cold snap, dubbed the “mini beast from the east”, sent temperatures plummeting to below zero across the country on Saturday but the Owls’ tenacious, hard-working display in West Yorkshire would have left supporters with a warm, fuzzy feeling inside. And Nuhiu led from the front. He terrorised Leeds’ backline, making a real Nuhiu-sance of himself. He held the ball up superbly and was a constant threat. He poked home the opener in the 71st minute after Adam Reach’s header from Jack Hunt’s delightful cross came back off the post. For the second match running, Wednesday conceded late on, with Whites substitute Jay-Roy Grot nodding in Pablo Hernandez’s peach of a cross. But Nuhiu maintained the Owls’ impressive record in Yorkshire derbies by bagging a dramatic winner in added on time. He raced on to Daniel Pudil’s through ball, outmuscled Matthew Pennington before expertly firing a low shot past young goalkeeper Bailey Peacock-Farrell to hand Wednesday their first league win since February 13. Manager Jos Luhukay: “Atdhe made the difference but the team worked very hard and we’re very happy with the win. He’s a very important player to the team. If Nuhiu continues to perform at such a high level between now and the end of the season, surely a new contract beckons? He’s enjoying a good run in the side, hitting six goals in Luhukay’s two and a bit months in charge. Nuhiu always wears his heart on sleeve and, when the Owls desperately needed their senior men to step up, he duly delivered. Another player who deserves a special mention is Sam Hutchinson. The tough-tackling midfielder returned to action after over two and a half months on the sidelines due to a hernia problem. Hutchinson replaced the injured Sean Clare and it was the 101st change Wednesday have made to their starting 11 this season, more than any other side in the second tier. Hutchinson slotted seamlessly back into the team and helped the Owls play with more urgency and drive. Hutchinson provided extra cover for Wednesday’s defence and gave Reach the licence to bomb forward and support Nuhiu and Lucas Joao. Reach was twice thwarted by Peacock-Farrell in a competitive first half. Hutchinson thought he had capped his comeback with a goal on the stroke of half-time. He headed in from close range after a neat knock down by Tom Lees but was denied by an offside flag. Hutchinson was subbed in the 66th minute to a chorus of boos from the home supporters, who were unimpressed with some of his agricultural challenges. But Hutchinson’s presence was huge in the centre and his contribution should not be under-estimated in the Owls clinching their first triumph at Leeds since 2007. “It was big to have Sam Hutchinson and Barry Bannan back because they bring quality, big personality and character,” stressed Luhukay. “Sam is a fighter and a winner. “He’s a very important player to us. The weather was ridiculously unpredictable. Sunny one minute. Heavy snow the next. Although Leeds settled quicker to a half-time snowstorm which left a light covering on the pitch, the hosts failed to force Joe Wildsmith into action. Gjanni Alioski drilled a shot over from the edge of the penalty area before Hernandez sent a free-kick into the side-netting. And Nuhiu made Leeds pay for their wastefulness in front of goal. 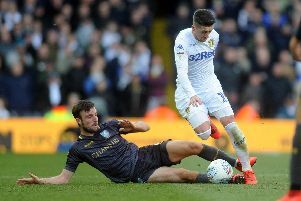 “You’ve got to be clinical and take your chances at one end and be ruthless, tight and disciplined at the other,” said Leeds boss Paul Heckingbottom. “The goals we’re conceding are nothing to do with a lack of effort from the players. It’s poor decisions at the wrong time. You’d be disappointed seeing those goals at any level. Things are finally looking up at Hillsborough after the club’s first victory in eight outings in all competitions. You could see how much it meant to the squad at the final whistle as they huddled together and celebrated the three points in front of the travelling contingent. It has been a shocking season and the players have, quite rightly, been heavily criticised, but this spirited showing silenced some of their critics and lifts, at least in the short term, the gloom around the place. “It was a very good day for us and an important win,” admitted Luhukay, who was relieved to secure his second league win in 12 attempts. With Hutchinson and Barry Bannan back from injury and Keiren Westwood, Jordan Thorniley, Joost van Aken, Marco Matias and Fernando Forestieri expected to return after the international break, there is some light at the end of the tunnel. Supporters can see a few green shoots of recovery again.